"Lucky clover" and "lucky leaf" redirect here. The term is also often used for the wood-sorrel (Oxalis acetosella) and Oxalis tetraphylla, a common potted plant. The four-leaf clover is a rare variation of the common three-leaf clover. According to traditional superstition, such clovers bring good luck, though it is not clear when or how that superstition got started. The earliest mention of "Fower-leafed or purple grasse" is from 1640 and simply says that it was kept in gardens because it was "good for the purples in children or others". A description from 1869 says that four-leaf clovers were "gathered at night-time during the full moon by sorceresses, who mixed it with vervain and other ingredients, while young girls in search of a token of perfect happiness made quest of the plant by day". The first reference to luck might be from an 11-year-old girl, who wrote in an 1877 letter to St. Nicholas Magazine, "Did the fairies ever whisper in your ear, that a four-leaf clover brought good luck to the finder?" It is claimed that there are approximately 10,000 three-leaf clovers for every four-leaf clover. However, an actual survey of over 5 million clovers found the real frequency to be closer to 5,000 to 1, twice the said probability. Clovers can have more than four leaves. Five-leaf clovers are less commonly found naturally than four-leaf clovers; however, they, too, have been successfully cultivated. Some four-leaf clover collectors, particularly in Ireland, regard the five-leaf clover, known as a rose clover, as a particular prize. In exceptionally rare cases, clovers are able to grow with six leaves and more in nature. The most leaves ever found on a single clover stem (Trifolium repens L.) is 56 and was discovered by Shigeo Obara of Hanamaki City, Iwate, Japan, on 10 May 2009. It is debated whether the fourth leaf is caused genetically or environmentally. Its relative rarity (1 in 5,000 clovers) suggests a possible recessive gene appearing at a low frequency. Alternatively, four-leaf clovers could be caused by somatic mutation or a developmental error of environmental causes. They could also be caused by the interaction of several genes that happen to segregate in the individual plant. It is possible all four explanations could apply to individual cases. This means that multiple four-leaf clovers could be found in the same clover plant. The other leaf traits, the red fleck mark and red midrib, a herringbone pattern that streaks down the center of each leaflet in a bold red color, were mapped to nearby locations, resolving a century-old question as to whether these leaf traits were controlled by one gene or two separate genes. White clover has many genes that affect leaf color and shape, and the three in the study were very rare. These traits can be quite attractive, particularly if combined with others, and can turn clover into an ornamental plant for use in flower beds. 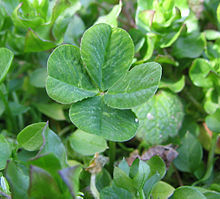 There are reports of farms in the US which specialize in four-leaf clovers, producing as many as 10,000 a day (to be sealed in plastic as "lucky charms") by introducing a genetically engineered ingredient to the plants to encourage the aberration (there are, however, widely available cultivars that regularly produce leaves with multiple leaflets – see below). There are some cultivars of white clover (Trifolium repens) which regularly produce more than three leaflets, including purple-leaved T. repens "Purpurascens Quadrifolium" and green-leaved T. repens "Quadrifolium". Some clovers have more spade shape leaves, rather than the usual rounded ones. This may be another plant, or another genetic mutation. Some genetic mutations in clovers include spade-like shaped leaves or a dotted rusty colour on the leaves. Trifolium repens "Good Luck" is a cultivar which has three, four, or five green, dark-centered leaflets per leaf. Italian automobile maker Alfa Romeo used to paint a four-leaf clover, or quadrifoglio, on the side of their racing cars. This tradition started in the 1923 Targa Florio race, when driver Ugo Sivocci decorated his car with a green clover on a white background. Los Angeles-based space exploration company SpaceX includes a four-leaf clover on each space mission embroidered patch as a good luck charm. Inclusion of the clover has become a regular icon on SpaceX's flight patches ever since the company's first successful Falcon 1 rocket launch in 2008, which was the first mission to feature a clover "for luck" on its patch. Celtic Football Club, an association football team from Glasgow, Scotland, have used the four leaf clover as the club's official badge for over 40 years. Former Japanese game developer studio Clover Studio used a four-leaf clover as their logo. Several businesses and organisations use a four-leaf clover in their logos to signify Celtic origins. The global network of youth organizations 4-H uses a green four-leaf clover with a white H on each leaf. The logo of the New Jersey Lottery features an outline of the state in white on a green four-leaf clover printed on a lottery draw machine ball. ^ Harry Oliver (2010). Black Cats & Four-Leaf Clovers: The Origins of Old Wives' Tales and Superstitions in Our Everyday Lives (reprint ed.). Penguin. ISBN 9781101442814. ^ Parkinson J. 1640. Theatrum Botanicum: The Theater of Plants or An Herball of Large Extent. Tho. Cotes. Publisher, London, Pp 1110-1112. ^ Masters MT. 1869. Vegetable Teratology, An Account of the Principal Deviations from the Usual Construction of Plants. Robert Hardwicke Publisher, London, P 356. ^ Child, Madge. 1877. In a letter titled "Four-Leaved Clovers," (St. Nicholas; an Illustrated Magazine for Young Folks), Volume 4, pp. 634-5, in the subsection of letters called "Jack-in-the-Pulpit", July 1877. ^ Bradley, David (31 October 2008). "Five-leaf Clovers". ScienceBase.com. ^ a b c "" How rare are four-leaf clovers really? ^ Levitt, Steven D. 160,000 Four-Leaf Clovers? New York Times. 25 May 2008. ^ Ross, Hailey "" The Free Lance-Star. 25 June 2018. ^ Hershey, David R. Re: how common is a five leaf clover?. MadSci.org. 16 March 2000. ^ Facts About Five-leaf Clovers Archived 2008-12-27 at the Wayback Machine. FourLeafClover.com. Retrieved 7 December 2008. ^ Five-leaf clover Archived 2012-09-08 at Archive.today. Mt. Vernon Register-News. 14 October 2008. ^ a b Alanah Eriksen (26 August 2011). "One in a million: Siblings found TWO seven-leaf clovers in their 'luckiest garden in Britain'". Daily Mail. United Kingdom. Retrieved 30 April 2015. ^ . Guinness World Record. Retrieved 20 November 2011. ^ "WEEK IN PHOTOS: Unlucky Kangaroo, 56-Leaf Clover, More". National Geographic. Archived from the original on 18 May 2009. Retrieved 17 March 2019. ^ Marcel Cleene, Marie Claire Lejeune (2002). Compendium of Symbolic and Ritual Plants in Europe: Herbs. 2. Man & Culture. ^ Tashiro, R.M., et al. Leaf Trait Coloration in White Clover and Molecular Mapping of the Red Midrib and Leaflet Number Traits. Crop Science 7 June 2010. ^  The Georgia White Clover Ornamental Collection. ^ The Four Leaf Clover Kit (Mega Mini Kits) (Paperback). Amazon review. 12 September 2006. ^ Good Luck Plant Kit Archived 2008-12-27 at the Wayback Machine. FourLeafClover.com. Retrieved 7 December 2008. ^ All About Shamrocks Four-Leaf Clovers Archived 2008-12-14 at the Wayback Machine. LollySmith.com. Retrieved 7 December 2008. ^ Keenan, Susan M. The Four Leaf Clover Archived 2009-01-30 at the Wayback Machine. HotFact.com. 11 March 2008. ^ "Clover Park School District Homepage". ^ "Clover Pub - European Pub". ^ "Celtic Computers - Computer Sales & Repairs". Wikimedia Commons has media related to Four-leaf clover.